An AAIB investigation revealed that a Boeing 767-300 landing accident at Bristol, U.K. was caused by rapid de-rotation of the aircraft following a hard landing. 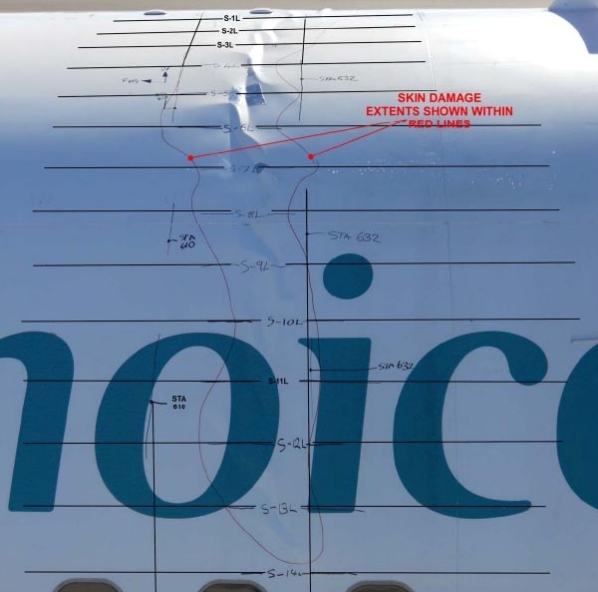 On October 3, 2010 a Boeing 767-300, G-OOBK, sustained substantial damage in a hard landing accident at Bristol Airport (BRS), U.K. Airframe stringers were cracked, bent or deformed and the skin was creased and wrinkled. Thomson Airways Flight BY519 departed from Cancún (CUN), Mexico on a scheduled flight to Bristol (BRS). There were 258 passengers and twelve crew members on board. The flight to Bristol was uneventful. It was raining and there was quite some turbulence during the ILS approach to runway 09. The aircraft was stabilised on the glide path at an average descent rate of about 680 ft/min (~11 ft/s), although there were fluctuations in airspeed, angle of attack and normal acceleration, indicative of turbulence. As the aircraft descended through 200 ft aal, the autothrottle and autopilot were manually disconnected because the ILS was unreliable below 200 feet. The airspeed was 141 kt at the time and the wind calculated by the FMC was from 138° at 25 kt. At a height of about 35 ft (just over three seconds before touchdown), the pitch attitude was just less than 1° nose up and airspeed was 142 kt. The descent rate was about 600 ft/min (10 ft/sec), with the wind, calculated by the FMC, from 116° at 20 kt. Aft control column was then applied and over the next three seconds the pitch attitude progressively increased to 3.5° nose up . However, there was only a gradual reduction in the rate of descent before the aircraft touched down on the main landing gear, registering a peak normal load of 2.05g. Coincident with the touchdown of the main landing gear, a momentary longitudinal deceleration of -0.27g was recorded. Both the commander and co-pilot were thrown forward during the touchdown, which resulted in the commander inadvertently moving the control column forward, to a nose down position. The spoilers also started to deploy at this time. The aircraft then became ‘light’ on its main landing gear whilst also de-rotating in pitch at about three degrees per second. At a nose down pitch attitude of just less than 1°, a normal load of 2.05g was recorded as the nose gear contacted the runway. The aircraft then rapidly pitched up and down, from between 3° nose up to just less than 0.5° nose down (indicating bouncing of the nose gear), before the aircraft eventually settled on the landing gear. Seven seconds after the initial touchdown, the thrust reversers were deployed, and the control column, which had remained in a forward nose down position since the initial touchdown, was progressively moved aft. Manual braking was then applied before the aircraft was taxied from the runway. The AAIB concluded that the damage to the fuselage occurred as a result of rapid de-rotation of the aircraft following a hard landing on the main landing gear. The runway profile, nuisance GPWS alerts and the meteorological conditions may have influenced the landing. – publishes guidance information that assists operators and National Aviation Authorities in the production and auditing of procedures to prevent the loss of Cockpit Voice Recorder recordings in accordance with the requirements of EU-OPS 1.160 and EU-OPS 1.085. – should advise operators of the benefits of establishing, in conjunction with aircraft manufacturers, acceptable maximum rates within their flight data monitoring schemes for events such as hard landings, beyond which action should be taken to reduce the rate. – should advise operators of the benefits of analysing recorded flight data relating to landings not only by airport, but also by runway. – review archived training and safety information, to ensure that relevant safety information is promulgated, and continues to be promulgated, to operators. The same aircraft was involved in a similar accident in September 2000. It was registered S7-RGV then and suffered a hard landing at Ho Chi Minh City Airport (SGN), Vietnam.